San Francisco. Mark and Kate are high school seniors set to graduate. There is just a week to go. While they are in the same class, they didn't know each other. But they are thrown together during a night of partying in the city. But their romances are with others: Mark has been in love with his best friend Ryan for years, while Kate has been set up with Violet but is nervous about following through. Neither romance is going smoothly, and Mark and Kate help each other out, suddenly becoming close friends, while becoming more distant from their long-term friends. There's lots of emotional drama, awkward silences, tearful confessions and reconciliations. Kate is an aspiring artist and we get a glimpse of the art world as she experiences unexpected success. Being in a context of very GLBTQ-friendly urban California, set during Pride Week, Kate and Mark don't have to struggle with homophobic prejudice -- their problems are standard teenage drama. It unfolds as these things do, and everyone survives. It's a well-told story, and the gay and lesbian themes make it interesting, but not a whole lot actually happens. The unabridged audiobook is performed competently by Matthew Brown and Emma Galvin. 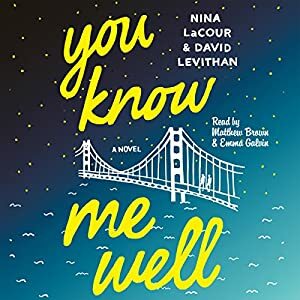 Galvin will be a familiar voice to anyone who has listened to more than a few audiobooks of YA lit for girls -- she read the Divergent series by Veronica Roth.